In an effort to prevent a bigot from obtaining this country’s 45th presidency, a Latino organization devoted to educating and encouraging Latinos to become agents of change in the country have created an innovated app to hopefully aid in that endeavor. Recently, at SXSW a Latino organization announced an innovative way of mobilizing millennial Latino voters to participate in the currently election season. An annual event during mid-March and held in Austin, Texas, South by Southwest—also known as SXSW—is a gathering of like-minded individuals who are changing the scope of film, interactive media, and music that’s all tech-oriented. The conference, of sorts, is a place for young and influential leaders who can shape the future to present their innovative ideas. So, it makes perfect sense for Voto Latino/strong> to present its downloadable app VotoPal which will be an innovative way for young Latino Americans to vote. Once downloaded onto your phone, VoterPal will allow users to scan their ID and register to vote. With the online fields automatically populated and a confirmation email sent within a matter of seconds, Non-registered voters will become instantly registered cutting down the time of the usual paper registration process. “So when we’re trying to figure on how to franchise the next group of Americans, we have to figure out where they are, how they talk, and more importantly, we have to use the technology that they crave,” said Maria Teresa Kumar, CEO & President of Voto Latino at the opening of the launch panel of the app. According to Kumar, the purpose of developing VoterPal was a means to mobilize voter turnout at the upcoming election by ensuring more Latinos become aware of how they can voice themselves within the political world through voting; especially since the current political climate has become quite hostile in-regards to Latinos and immigrant living within the country. Another purpose for the app’s creation is due to the recent changes to the Voting Rights Act made by the Supreme Court which greatly affected states like Alabama, Mississippi, North Carolina, South Carolina, and Texas which happens to be the five states that have the lowest Latino population. “As we see these sweeping demographic changes, what we find in the Latino community, is that they often don’t know how to navigate the political process. We have to figure out how to modernize our election systems,” said Kumar. During the panel, Kumar was joined onstage by actress America Ferrera, who happens to be the Chair for Voto Latino’s Artist Coalition. Ferrerra came onto the panel as a source of someone who understands the mind of young Latino voters. And which is not surprising for Ferrerra, the former Ugly Betty star knew exactly what she was talking about. “That’s why I feel this work is so empowering to me. There is an answer. We just need to resource and give people the proper tools and educate them, and ask them to be a part of the conversation,” said Ferrera, describing the importance of involving more American Latinos in the voting process by providing a better outreach to the community. 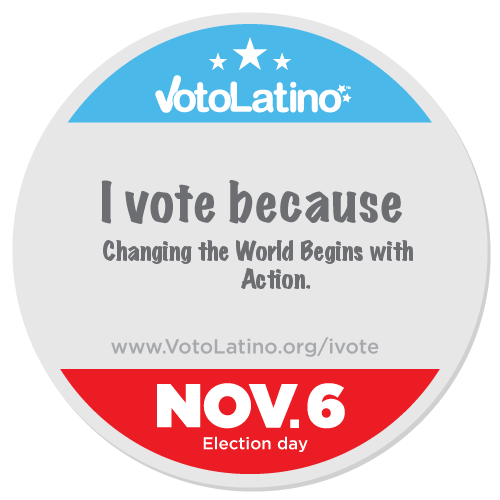 As a way of providing voter outreach, Voto Latino will continue to pursue their effort in getting more Latinos registered to vote by promoting the VoterPal app throughout the election season by present at conferences and college campuses across important electoral states like Nevada, Texas, Arizona, Colorado and California, with plans to expand to New Mexico and Florida.